I remember Dorothy as a lecturer in Mathematics at the Lady Spencer-Churchill College. She had an enormous eye for detail and produced lists for everything. To such an extent that when she was about to leave at the time of the amalgamation with the Polytechnic she produced a timetable which lasted for many years after her leaving. 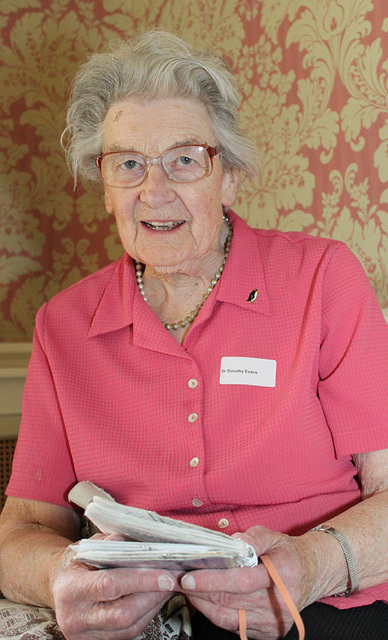 She had a great sense of humour and was close to the Principal Lady Linstead. There are stories of Lady Linstead spotting a spelling mistake on a notice and phoning Dorothy Evans up and asking what she would do about it. A similar request early in the morning was to note that it was snowing. I think Dorothy replied that she would get the snow ploughs in action. I remember her as I am sure others will as a person with a great heart. One always knew where to go to get a good answer. I met her in recent years and again she made notes of the meeting. What was written down never came to action and one knew that all was not well. Most of us would have given up long ago but not Dorothy or Dot as we knew her. As I say these are limited thought after forty years. The important thing is that remembers her with admiration, awe and love.